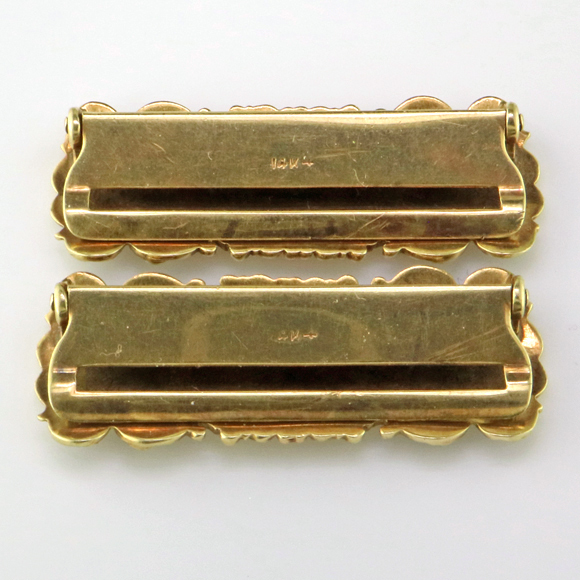 Our latest find in the Estate Department is this beautiful pair of gold shoe buckles. 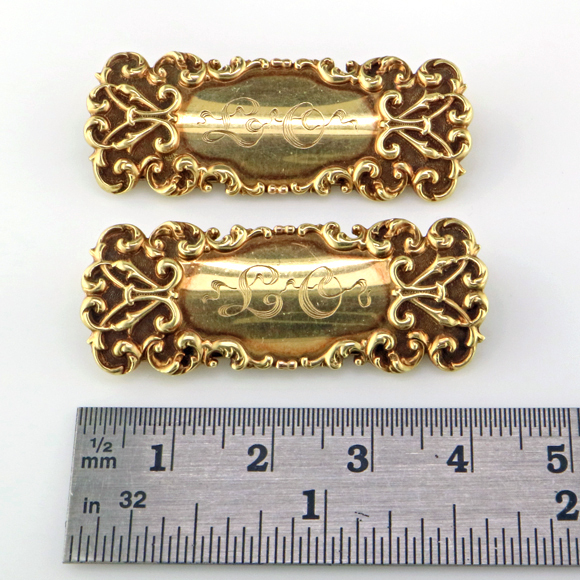 They are fabricated of 14K yellow gold. The style and method of construction suggest they were made in the early 20th century. At first, we thought they might be for suspenders or lingerie straps. That didn’t exactly make sense. Women don’t often wear suspenders and the buckles are too heavy for lingerie. 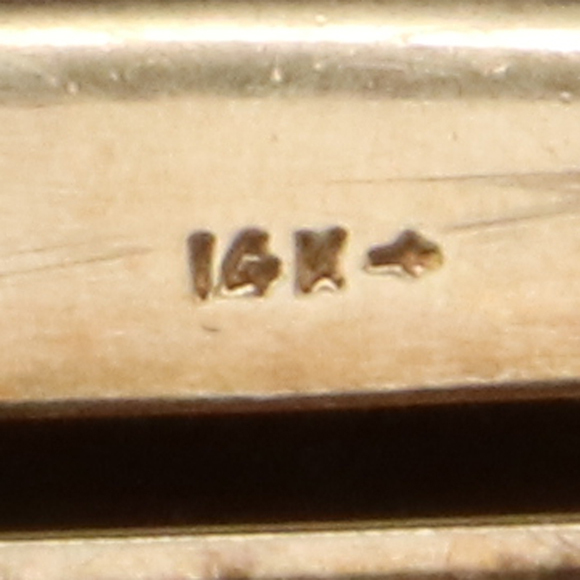 In researching the maker’s mark, one of our friends in the gemological community suggested they might be shoe buckles and sent over this image– Bingo. 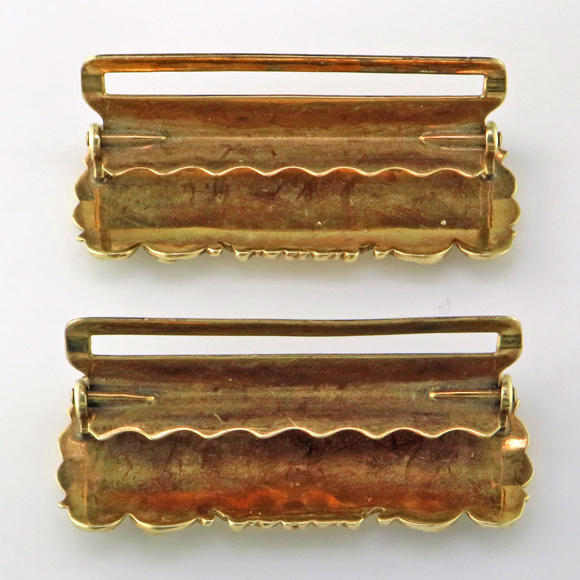 Not quite so fancy as our vintage buckles but you get the idea. The buckles are designed for a strap that is ~ 1 3/8 inches wide. The rectangular opening in the clamp is where a strap attaches, then the other strap slides under and out. The clamp closes easily and the serrated edge insures a perfect fit and a secure grip. 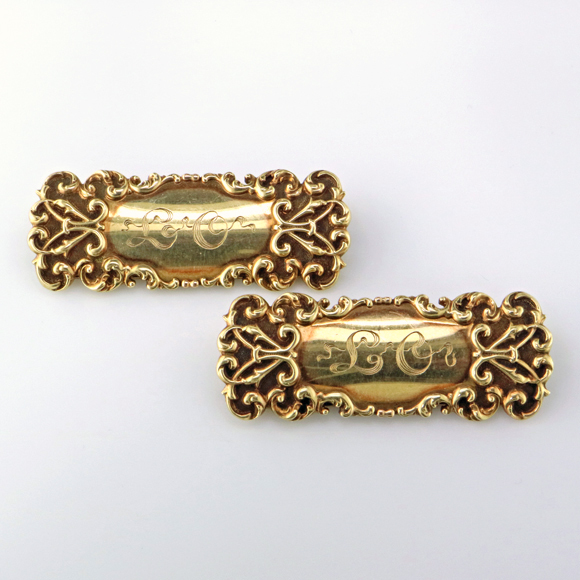 The size of the buckles suggests a small foot, and the ornate style and beautifully engraved initials suggest a gift– perhaps something special for the Debutantes’ Ball! As always, our Estate Department offers many interesting treasures from the past. Stop by and shop or just enjoy browsing.. We’re open Tuesday thru Saturday, 10 to 5:30. If you have jewelry you’d like to sell, we’re always open to buy. If you need appraisals or information about jewelry you own, our staff of gemologists are at your service with expert advice and information. We also offer consignment services for auctioning high value items. Call for an appointment. This entry was posted on Wednesday, October 25th, 2017 at 11:07 am	and is filed under Estate Jewelry, Featured Post, Jewelry Facts. You can follow any responses to this entry through the RSS 2.0 feed. Both comments and pings are currently closed.